Most of the prairie in eastern and south-central Nebraska has been converted to cropland and/or other human development. This has relegated many of the remaining prairies to small isolated patches, which makes life difficult for many prairie species. While that level of habitat fragmentation is mainly in the eastern half of the state, there are similar levels of fragmentation in some parts of western Nebraska as well. While it’s not possible – or even desirable – to turn back the clock on prairie conversion, there are opportunities to restore prairies around and between isolated habitat fragments to rebuild larger blocks of grassland. Those larger, more connected habitats can then support larger numbers of species, and healthier, more viable populations. Prairie restoration can be a valuable educational tool when it is used to create prairie habitat near schools and in other public areas. Native prairie vegetation can be an excellent choice in yards, acreages, campuses, and other areas where there is a desire to reduce the need for watering and other maintenance. Wildlife habitat plantings that include a diverse mixture of prairie plants can help prevent the spread of invasive species by using only native plants and can benefit a wide range of wildlife species. Most valuable to conservation, however, are prairie restoration projects that are strategically located and designed so that they de-fragment the landscape for prairie species. Using Prairie Restoration as a Conservation Tool. Lessons From Large Restoration Sites. Bill Whitney, of Prairie Plains Resource Institute (PPRI). PPRI was the pioneer of high diversity prairie restoration in Nebraska and are still one of the leaders. They restore over 1,000 acres per year for agencies and private landowners. There is an excellent guide to prairie restoration techniques for Nebraska, written by Gerry Steinauer and others. You can download that guide here. Prairie restoration consists of several steps. You can harvest seed yourself or buy seed. If you buy seed, be sure to ask questions about the genetic origins of the seed to be sure it’s both native and from as close to your planting site as possible. Try to get the most plant species in your mixture that you can, and try to spread blooming times across the season (for pollinators). Harvesting your own seed can be rewarding experience and may be easier than it first seems. The first task is to find native prairies in your area and obtain permission to harvest seed. The next tasks are to learn to identify the species you want and how to tell when the seeds are ripe. Determining the ripeness of seeds is the same for all species, but you have to find the actual seed kernel first. Once you find the seed, you can pinch or cut it open; if it’s doughy or hard inside (rather than juicy or milky) it’s ready to harvest. The last key to seed harvesting is to be as efficient as possible. Find large patches of the target species so you can harvest a lot of seed quickly. Strap buckets to your waist so both of your hands are free to harvest, and grab/cut entire seed heads rather than individual seeds or flowers. Once you have the seed, lay it out until it’s dry. Then break the seeds from the pods/stems and separate them from each other by hand or by running them through a hammermill or leaf mulcher. Then store the seeds in paper sacks or buckets with loose-fitting lids so they stay cool and dry. 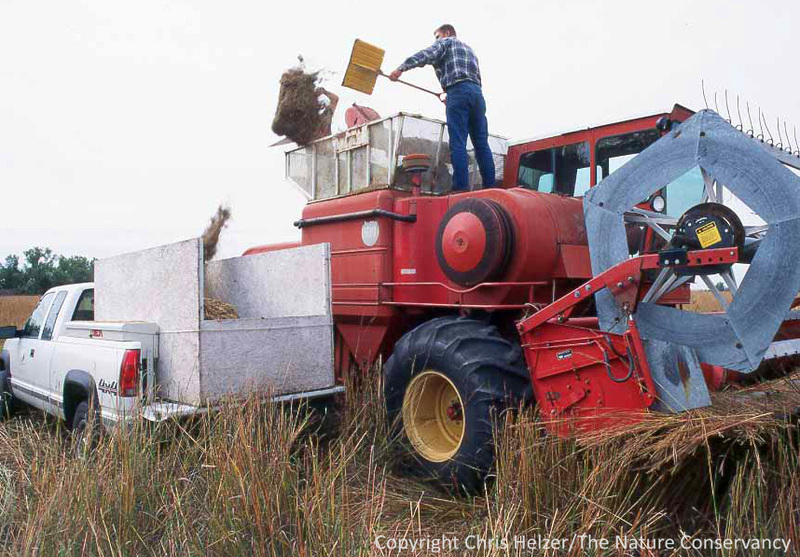 Hand harvesting is sufficient for most pland species, but a combine or other machine can help get sufficient quantities of major grass species. The easiest success comes from land that has been farmed during the season previous to planting. Farming reduces the abundance of aggressive weeds that might threaten a planting during its early years, and also provides relatively bare soil to seed into. It’s necessary to ensure that any herbicides used during that last year of farming don’t leave any residue that could affect new seedlings. Roundup Ready crops are often the easiest because the chemical in Roundup (Glyphosate) has no residual effect, but many farmers include other herbicides along with Roundup, so it’s important to check. With soybeans, seed can be broadcast directly into the harvested stubble. After corn harvest, it’s usually a good idea to disk the site to remove the ridges and expose more bare soil prior to planting. When planting into existing vegetation, such as native or non-native grasses, it’s necessary to reduce the competition from those grasses and provide for seed-soil contact. If the site is a pure stand of smooth brome or some other grass that you want to eliminate completely, use a combination of multiple herbicide and disking treatments to ensure that both the living plants and the majority of seeds in the soil are eliminated (or, better yet, farm it for a couple years.) If you want to keep the existing grasses (and it’s not an unplowed prairie), disking can break up those grasses and provide a good seedbed without killing the majority of the grass plants. When trying to enhance the plant diversity of an existing native prairie, be very cautious about disturbing the soil through disking and ask several experts for advice on your options. There is still much to learn about enhancing native prairies through overseeding. Broadcast seedings (as opposed to drilled seedings) are becoming the choice of most prairie restoration projects across the country who are trying to establish diverse seed mixtures. Broadcasting has a couple advantages over drilling; seed needs to be cleaned much less to feed through broadcast seeders than drills, seeds of various sizes and shapes can be mixed into one hopper, and broadcasting uses much more available equipment (or can be done by hand). Some sites may require harrowing or some other method for incorporating broadcast seed into the soil – others don’t. Experimentation with some small plots the year prior to doing larger scale seedings is a good idea. Most successful high-diversity restoration in Nebraska uses relatively light seeding rates (3-6 pounds of pure live seed per acre). Higher seeding rates, especially when tall warm-season grasses make up a high percentage of the seeds, can lead to overly-dominant grass that suppresses wildflower diversity. Broadcast seeding is becoming the method of choice for high-diversity seedings. A drop spreader like the one shown here drops seeds straight down and can be pulled behind an ATV, truck, or tractor. The drop spreader also has an agitator inside to help with fluffy and messy seed mixtures. Seeding during the dormant season (late fall through early spring) usually provides the best success. This allows seeds to experience some freeze/thaw cycles, which is important for the germination of some species and also helps them settle into the soil. Often, seeding into snow can help that process and also allows you to see your tracks as you go. If possible, seed a prairie over several years – rather than doing the entire site in one year. Prairie establishment varies substantially from year to year, even when the same seed mix is used. Some plant species establish well one year, but not the next. By spreading the project over several years, the plant diversity of the entire site is likely to be higher. During the first year of establishment, the weed pressure needs to be evaluated. In many cases, no control of weeds is needed because the perennial prairie plants will outcompete annual weeds over a period of several years, and weed control can sometimes hurt the prairie plants as well as the weeds. On the other hand, if weed pressure is so heavy that light is prevented from hitting the soil, some mowing (high – above the tops of most prairie plants) can sometimes be useful. Often, only a few patches will have dense growth of weeds like giant ragweed that may require mowing. Weeds can look very dense from a distance, so it’s important to walk out into them to really see whether or not light is hitting the ground. Aggressive perennial weeds and designated noxious weeds will need more aggressive treatment. Annual dormant-season fire can help establishment during the first several years by removing the previous year’s thatch. Once most of the prairie plants have established, the prairie can be managed like any other prairie – see more information on that here. An anectdote about lasting effects of a planting technique. The success of a restoration project depends upon whether or not it meets the objectives you set. Be clear about what you want to accomplish, and then figure out how to measure whether you achieve that – and whether that success is stable over time. Often, the 4th through 7th year of a prairie restoration look great, and then invasive species and aggressive native grasses can start to decrease plant diversity. Careful management is important to maintain that species diversity and also to provide varying types of habitat structure. 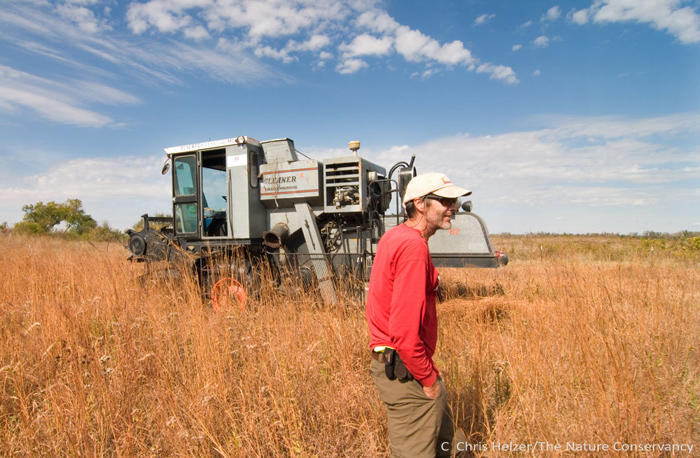 How to measure success in prairie restoration. Ideas for landowners about how to measure success. Varied perspectives on defining prairie conservation success. Why grassland birds are a poor indicator of larger prairie conservation success. Shoestring Acres –Shoestring Acres seed is a small, native seed farm located in Antelope County on the western boundary of northeast Nebraska. We offer local ecotype wildflower and grass seed that is adapted to upland environments.